Workshops will be hold on Friday, August 29, after the main conference. They are 150 minutes in length. Participants are encouraged to bring along their own laptops for hands on exercises. Please note that this list is still subject to change. All you need to create the sample application is a Texteditor of your choice and Firefox 3 with the SQLite Manager extension on Linux, Mac or Windows. 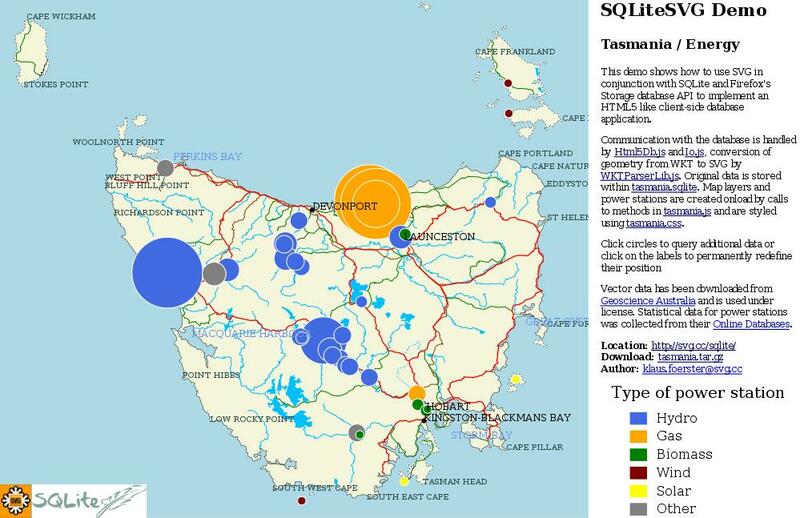 A sample database with geometry and data for the region of Tasmania will be provided. Vector and statistical data for the demo SQLite database has been downloaded from Geoscience Australia and is used under license. As this example demonstrates clientside database storage it must be run locally. Please download tasmania.tar.gz, unpack it, open tasmania_init.html with Firefox 2 or 3 and continue to the demo (Screenshot). One of the major additions to Dojo since last fall was dojox.charting --- simple charting package on top of dojox.gfx, which leverages SVG, or other graphics facilities if SVG is not available. This course discusses design objectives and correspondent decisions, the final API we come up with, and how SVG shaped the package. Short introduction to dojox.gfx is given as well. Abstract: this workshop will present a practical overview of SVG filters applied to both vector and bitmapped graphics. Participants will learn how to use simple filter effects in isolation as well as more complex filters including compound filters including animation effects and scripting. The workshop will present numerous examples, providing each participant with an illustrated handout containing code and examples. The workshop is intended for anyone who already has a good working knowledge of SVG basic elements (rect, line, path, image, gradients and the like). B. The basic filter tag, filter primitives and syntax. This course introduces students to Inkscape and its use in creation of SVG for applications such as print, web, art, illustration and diagramming. It will cover what Inkscape is and also what it is not. Some of the uses for which Inkscape is appropriate will be shown, along with some of those that are best suited for different software. Each of the main tools will be explained, with information given on the available options and some of the uses they can be put to. A few dialogs that are most common for basic use will be presented. The course is intended for the novice who wishes to learn how to start using Inkscape and the basic user who wishes to fill in gaps in knowledge to cover the full set of core tools. By the end of the course students should have learned enough to feel comfortable opening up Inkscape and getting started on graphics, art, illustrations or diagrams.